Songkran Festival is the new year celebration of Thailand. It's also known as Thai New Year. People of Thailand consider it a time to pay respect to their families, friends, monks and Buddha. People consider the splash of water on this event as a symbolic thing that can remove all of their previous sins and can make you clean from all kind of bad lucks or misfortune and start a new year with getting the blessings and good luck for you. in the previous years, people use small bowls of water to throw water on their friends and family to have fun and enjoyment. But now a day people are using water guns, water buckets and water cans to throw water on each other and the water fight during the celebrations of Songkran Festival can be bigger than your expectations. As there has come a variety in water pots that can be used to throw water on others during the celebrations of Songkran festival, so there is great possibility that you are going to get wet during this event. If you are planning to visit Phuket in Thailand during Songkran festival, then this can be a good guide for you, because it can help you to know about the history of the Songkran festival, what is the importance of Songkran in Thai culture, what you can do during your visit to Phuket and what places you must visit in Phuket during the celebrations of Songkran festival. New year celebrations of Thailand can be a wild and wet event for everyone in the entire country. But the celebrations that you can enjoy in Phuket are of an international level and can be the most energetic among all of the other places. You can find tourists, locals and expats together enjoying the water fight by throwing a splash of water on each other through water guns, water cans and water buckets. 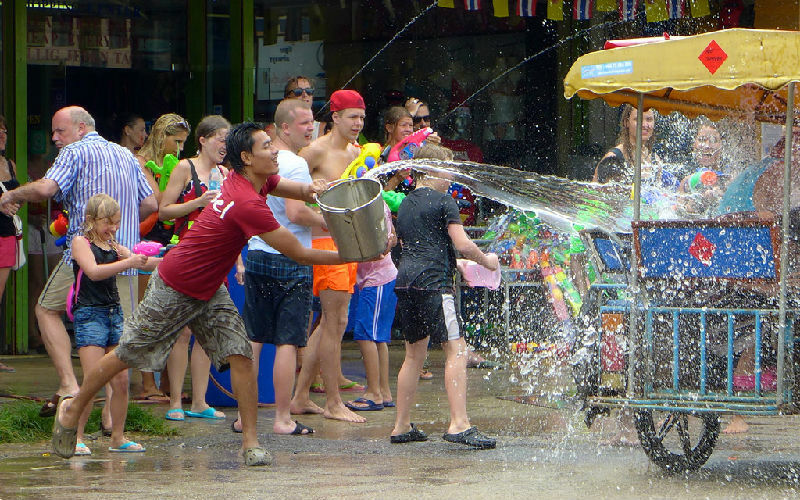 The water fight is the most important thing during the celebrations of Songkran festival. These immense water fights can take place along the roads at multiple different places in the island, and you may find some pick-up trucks having a large number of youngsters on them throwing water on everyone who passes by them. They enjoy the water fight in this way and craziness during these water fights can be on its peak. Patong is a main host for the celebrations of Songkran festival but Phuket comes on the second number for the hosting of celebrations of Songkran festival. With having street parties, you can join some traditional activities during Songkran festival's celebration to enjoy more. Well, the major activities or events of Songkran festival in Phuket take place at Queen Sirikit Park in Phuket city on 13th April, and you can enjoy daily activities at Saphan Hin Park during the celebrations of Songkran festival every day from 9:00 am to 6:00 pm. You can see the most traditional aspects of Songkran festivity during Songkran celebrations in Phuket which includes the procession of Buddha images and different ceremonies to pay respect to elders with scented water. 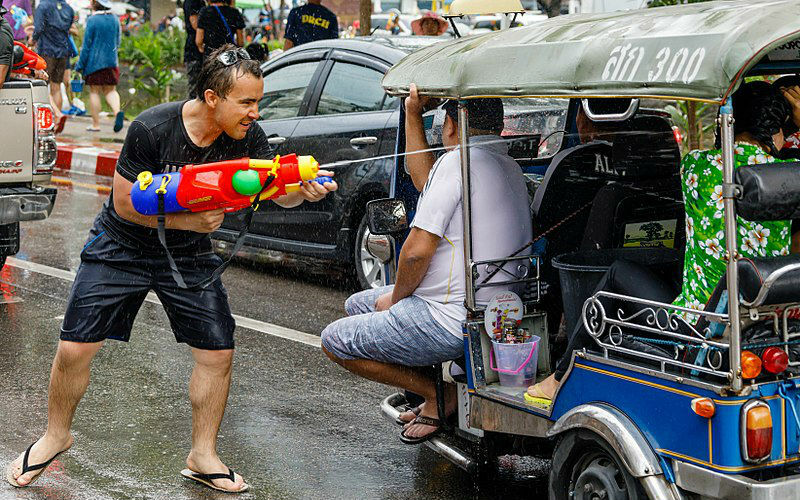 You can never even think about to visit any place during the celebrations of Songkran Festival without being wet, particularly if you are riding a motorbike or have hired a tuk-tuk for your travel. No one mind being wet during the Songkran celebrations, so, there is no way to stay dry during the days of celebrations. The best advice for you to enjoy more during Songkran celebrations in Phuket joins the water fight but do not forget to put your wallet or other important papers at your residence, because they can be damaged during water fight by getting wet. If you do not want to be a part of the crazy crowd during the celebrations of Songkran festival, then it is better for you to visit local villages and do not go to tourist centres. You can enjoy many of traditional activities that can be hosted by the major resorts. Do not forget to bring a plastic bag to save your important things, if you want to enjoy a water fight. And be sure that you have a water pistol, water cane, water bottle or water bucket with you. You can get these accessories easily from any of the roadside stalls. Do not forget to bring spare clothes, if you have a plan to visit any other place after enjoying a water fight. --Read more on What to Pack during Songkran Festival. It can never be a better idea to rent a motorbike especially during the celebrations of Songkran Festival. --Read more on How to Survive in Songkran Festival. Phuket is the busiest island especially during the celebrations of Songkran festival. You can find a large number of people at the Patong Beach area. You can find huge water fights there. People either local or foreigners, you can find there throwing water on each other and having fun. If you want to enjoy the Songkran Festival and want to be a part of the water fight then, street parties of Songkran festival can be the best option for you. But if you are one who does not want to be a part of a water fight and wants to enjoy calmly, then to be a part of traditional events can be the best option for you. If you want to be a part of wet parties of Songkran, you can be a part of them in Phuket Town at early morning, which can turn into craziest fights in the afternoon. This water fight lasts till night and ends at Bangla Road. People who are going to join festival can be divided into two parts, one category can be of those who want to be a part of street celebrations and the second category is of those who travel through pick-up trucks to have fun. If you want to travel to Thailand during these days. The transportation and accommodation will be a big problem. During the holiday, most of them will be sold out months before the festival. The streets will be a grand water carnival. Contact us and we can help you avoid the hassles, and have a Thailand local experience that includes the best of the Songkran Festival! Water Battle by Tuk Tuk and get into the heart of the water battle! Water Party in Silom Road. Spot the firetrucks ambushed at each intersection with their incredibly powerful water hoses. Continue to Pattaya where helds a week-long Songkran celebration and colorful nightlife. Elephant sanctuary: wearing Karen clothing and bath these cute creatures. If this still cannot meet your requirements, contact us to customize a super tour for you!